Do you think that the exterior of your home needs a fresh coat of paint? If you are not able to make a decision of hiring a home painting contractor, here are three questions to solve your dilemma. The decision to paint the exterior of your home is a nice way to improve the aesthetic appeal of the property. If you live in a cold region, change in temperatures can damage the siding as well as the exterior wooden structures. But, it doesn’t mean that you have to undertake repair work every other year. If you to take care of your home, you will be able to avoid expensive repairs in the future. If you want to protect your home, a good idea is to paint the walls and the wooden structures with good-quality paints. 1. When was the last time you painted the Exterior of the Home? As the exterior part of any structure has to bear harsh weather and pollution, it requires care. And, an old painting job is not effective in providing adequate care. If the wood siding of your home was painted 3 years ago, it is the best time to repaint it. It is because wood is susceptible to damage and can rot quickly. It is ideal to use a strong latex paint because it guarantees a durable and lasting finish on the wood siding. A paint job on the aluminum siding has an average lifespan of 5 years. So if your home has aluminum siding, make sure to consider the age of the paint job before making a decision. 2. Does your Home provide a Nice Curb Appeal? Visual impact is hard to beat when potential buyers are looking at residential properties. If you are thinking of selling your home, it is important to project a beautiful image of your property. Also, the exterior of a home is a good indicator of the well-being of the property. And, painting the exterior of your home is the cheapest way to create a positive impact on buyers. 3. Does the Exterior of the Home need any Sort of Repairs? The exterior of your home may be in dire need of repairs. But, if you ignore it, it can lead to major problems in the future. If you hire an experienced home painting contractor, he will able to highlight the problems effectively. He will not only paint your home but will also take care of minor repairs and replace damaged materials efficiently. It is like killing two birds with one stone! Asking the right questions is a proper way of assessing the condition of your home. 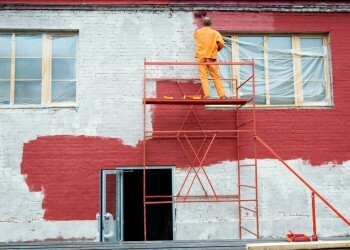 If you have come to the conclusion that your home needs a paint job, contact a professional. It is important to hire an expert home painting contractor because he will help you to finish the job efficiently. A good exterior home painting job can add valuable life to your home. Contact Toronto’s best painting company to obtain the best services at affordable prices. Get in touch with Perfect Painters for on-site inspection today. Do you allow guest posting on your blog ? I can provide hi quality posts for you. Painting Tips for the Kids’ Room: How to create a Happy Living Space for your Children?